Carsen Edwards is off to the NBA, and it is probably a good thing for him. After having an exceptional NCAA Tournament and pulling Purdue as close to a Final Four as it has been in 39 years his stock could not be higher. Short of returning next year and throwing up Glenn Robinson-esque numbers he was not going to elevate his draft stock more. We definitely wish him well. He leaves Purdue as a two-time All-American, likely two-time Jerry West Award winner, 7th overall in scoring, and with a slew of records to his credit. Naturally, the media will write Purdue off again. The Boilers lost a ton coming into this season but Carsen alone kept them as a preseason top 25 team. After a slow start Purdue rallied to win a share of the Big Ten and reach the Elite Eight, exceeding what the 2017-18 team did. We now lose three starters from a team that went 26-10, 16-4 and won a share of the conference. So what are the reasonable expectations for 2019-20? First, let’s look into the numbers. Carsen averaged 24.3 points per game, but as we saw in the four NCAA games, it was more than that. We lost his ability to explode for 40+ on any given night. I say any given night because he lit up the nation’s best defense for 42. You’re not going to have someone walk-in off the street and instantly replace that by himself. Ryan Cline also averaged 12 points per game and Grady Eifert had a respectable 5.5 per game. That adds up to 41.8 points per game. That’s a lot, but not impossible. As a team Purdue averaged 76.2 points per game in 2018-19, which was a 5 point dip from the 81.1 averaged in 2017-18. That team had 14.7 ppg from Isaac Haas, 14.6 from Vincent Edwards, 12.0 from Dakota Mathias, 7.5 from P.J. Thompson, and a small 1.8 from Jacquil Taylor. That was 50.6 points per game, so a slightly higher percentage was lost. Now granted, Carsen himself picked up a lot of that, but others carried more of the load. Carsen only improved by 6 points per game, but his usage rate opened things up for everyone else. Cline jumped from 4 to 15 points per game. Eifert gained nearly four points per game. Haarms jumped from 4.8 to 9.4 per game. Purdue’s four freshmen were also contributors at a combined 14.6 points per game. Evan Boudreaux was a solid newcomer at 5.2 ppg, contributing a lot early before falling off late. This is probably the more encouraging area. Carsen rarely left the game, playing 35.4 minutes per game. Cline was second on the team at 34 per game, while Eifert was at 25.6 per game. That’s 95 minutes per game of 200 available. It is significant, but let’s again look at 2017-18. Haas was at 23.4 mpg, Vince at 31.6, Mathias at 31.4, and Thompson at 27.9. Jacquil had a modest 6.1 per game, but Purdue still lost 120.4 minutes. Guess where all those minutes went, however. Sure, Cline, Eifert, and Carsen took some of them, but Carsen only took six, Cline 16.7, and Eifert 17.3. the rest went to freshmen and sophomores that gained a ton of experience as the year went on. In Aaron Wheeler and Sasha Stefanovic you basically had two players that gained a year of redshirt experience because there were no minutes available at all for them in 2017-18. Their loads will increase significantly, but that is not a bad thing. Sasha played extremely well in the World University Games and everyone wants more Wheeler after what he showed in moments this year. Matt Haarms – C – Haarms had a crash course in starting the Butler and Texas Tech games after Haas was injured, but became the full-time starter in the middle this year. He improved from 4.8 to 9.4 ppg while only playing less than 6 more minutes per game. He improved all of his percentages and had moments where he looked great. He is Purdue’s top returning scorer and is a vastly different type of player than Haas. I really liked the way we started using him on the screen and roll and he gained confidence as the year went on with his shooting. I can probably count on one hand the number of times Haas shot a field goal more than 5 feet from the rim. Haarms opened things up because he has more range. He finished the year 7 of 25 from three, giving us the most outside shot ability from a big since A.J. Hammons, and Hammons really didn’t shoot threes until his final year. Haarms needs to improve his rebounding (5.4 per game), but seeing him jump to a 15 and 7 guy per game with two blocks is not outside the realm of expectation. Nojel Eastern – PG – If I had a single wish it would be that Nojel finds a jump shot. I think Nojel can take over Carsen’s role in attacking the basket and his size makes him quite formidable in such a role. He can be a great scorer at the rim and his free throw shooting has improved significantly. Teams are playing off of him though because they know he is not a threat to score with a jumper. In 2017-18 he actually hit three 3-pointers (against Fairfield, IUPUI, and Maryland), but he has not hit from long range since January 31, 2018 against the Terrapins. He only even attempted four this season. His role in crashing the glass and getting offensive rebounds (nearly two per game) was huge. Getting these garbage baskets were huge all season. He improved from 2.9 to 7.5 ppg, and we need him as a double figures scorer while still being an ace defender. His assist to turnover ratio also improved to 2.5:1.4 from 1.1:1.1. Aaron Wheeler – SF – I am ridiculously excited to see what Wheeler can do in a larger role. He is an athletic 6’9” wing that can shoot or dunk on people’s heads like he tried to do in the Virginia game. In only 13.7 minutes per game he showed a ton of potential. Now for even better news: per our own Casey Bartley he is working with Carsen’s shot doctor. He shot 36.5% from three this season and will return as our leader in made threes with 31. I am fine with giving him all of Grady’s minutes because I think he can play either forward spot. Ideally I would love to see him develop into being a more athletic Robbie Hummel. I am also fine with finding different ways for Nojel to throw him alley-oops. Trevion Williams – PF – Can Purdue play Williams and Haarms at the same time? How much does Emmanuel Dowuona coming out of redshirt affect minutes at the five? Does Evan Boudreaux take the gritty Eifert role? I go back and forth here between Tre and E-Bo because both have pretty good strengths, but significant weaknesses. E-Bo has the crafty old man’s game and showed early in the season he has some range from three, but (to put it nicely) he is slow. Trevion has tremendous potential, but needs to drop some more weight and work on his conditioning. If he can transform his body this offseason like Biggie did between his two years in West Lafayette he can be an exciting player. Tre had some very brief flashes with his outside shooting too by going 1 of 3 from three, hitting one in the home finale against Ohio State. Brandon Newman – SG – Does Newman start from day 1? Sasha seems the most likely to take Cline’s spot as the lineal representative from Mathias-Cline-Stefanovic. I think he has some very good potential to be a Dakota-esque player too, plus I like his size for the position. Newman is coming off a year where he established a ton of records at Valparaiso. The only time I saw him in person he was 7 of 25 from the floor in a loss to Zionsville, but I know that is an outlier. He is known as a shooter and has excellent athleticism as a 6’5” guard. Eric Hunter Jr. – Reserve guard – Hunter is another player I really like on potential. He finished his high school career with 2,583 points, seventh all-time in Indiana and only 12 points fewer than some guy named Rick Mount. He scored just 77 points this year, but was very steady in 12.6 minutes per game. I would love to see him put on some weight in the weight room and become more dynamic. We saw flashes, for sure. He did very well in a spot start for Nojel against Old Dominion in the tournament. He was 10 of 46 from three, but hit a big one against Virginia. There is no question is minutes will go up. Sasha Stefanovic – Reserve guard – What I want for Sasha is simple: be the next Mathias or Cline. Percentage-wise he is our top returning three-point shooter at 41% and he is going to get a lot more looks now with Cline gone. He has seen the role envisioned for him for the past two years. Now he needs to embrace it. Evan Boudreaux – Reserve forward – Early in the season E-Bo was playing 20 minutes per game and he even had 18 points in the narrow loss to Virginia Tech, a Sweet 16 team. From March 1st onward he only played in three games for a total of 17 minutes, 12 of which came in the beatdown of Ohio State. After being in double figures in five of Purdue’s first seven games he practically disappeared late as Trevion took his minutes. I love his offensive game. Unfortunately, he is very, very slow on defense. Can he take the “Gritty Eifert” role? What makes things really interesting is that he will be Purdue’s lone scholarship senior, so anything we accomplish in 2019-20 makes 2020-21 even more exciting. Emmanuel Dowuona – Reserve Center – Pretty much all we have heard about him was “Great defender, limited offensively”. He was also in a boot for a good portion late in the season, thus likely limiting what he could do in practice. He was still a 4-star, top 100 recruit per ESPN. I can envision a rotation at the five with him and Haarms while Trevion and E-Bo rotate at the floor, leaving Wheeler to rampage at the three, at least offensively. Isaiah Thompson – Reserve Guard – Unlike Newman, I have seen a ton of Isaiah since he was a freshman in high school. He was a 2,000 point scorer at Zionsville and helped them reach heights they had not seen in decades. He won four conference titles, two sectionals, and took them tow-to-toe with eventual state champ Carmel in the regional final this year. He is not the same player as his brother. He has some Carsen in him, but is not built as thick as Carsen. He can heat up from three and has 25-30 foot range on his shot. He is not the distributor PJ was, either. I can see him having a role in 2019-20 similar to what Hunter had in 2018-19, with at least one game where he hit four threes. Mason Gillis – Reserve Forward – I have absolutely no idea what to expect from Gillis, who missed his entire senior year with a knee injury. He was recently cleared to begin running and jumping more with him expected to be 100% by June, but still, he is coming off of a knee injury. He averaged 21.6 points per game his junior year with 12.2 rebounds and was a4-star recruit per Rivals. He also shot threes at 45%. If he can really do that he has a role as Wheeler’s backup. Tommy Luce – walk-on – National Player of the Year, obviously. He shot 100% on the season from three for crying out loud. Carsen who? Kyle King – walk-on – Horcrux. Purdue made a Final Four in 1969 with his grandfather as coach and in 1980 with his grandfather as AD. As a result, we’re making a Final Four in the next three years since it nearly happened this year when he played 17 minutes in eight games. All he needs to do is finally score his first point. It has been a while since Purdue has been in this position without a significant drop off. In fact, THIS year was supposed to be the big drop, and we ended up exceeding last year. Now we’re fighting history a bit. Purdue has made five consecutive NCAA Tournaments. It hasn’t made six in a row since going to eight in a row between 1993-2000. We have made it to the Sweet 16 three years in a row, something that was only done one other time in 1998-2000. 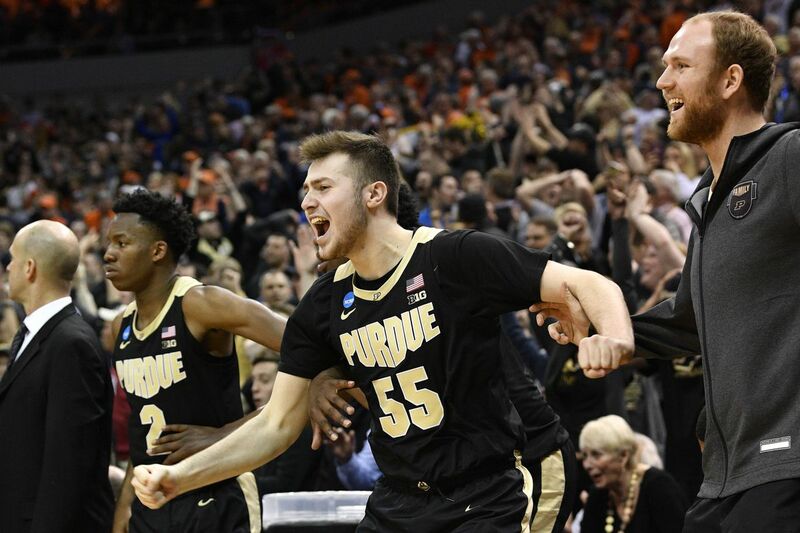 Purdue has finished in the top four of the conference five years in a row, has been a top 4 NCAA seed three years in a row, and is a rebound from three straight Big Ten titles. That’s really the biggest question. Purdue will make the 2020 NCAA Tournament because, as a program, we are in the position where that is the bare minimum expectation each year. We have too much returning experience to miss the tourney entirely. We also still have Mackey Arena, where we just don’t lose. That means another top half conference finish and at least a chance at another March run. As for exceeding those expectations, well, just look at this past year.